In the ultimate 'gig economy' offer, this book introduces an alternative to hanging out in bars badgering ever Fixer you know for work. Sign up with Edgerunners, Inc. instead. There's quite a lot in here. 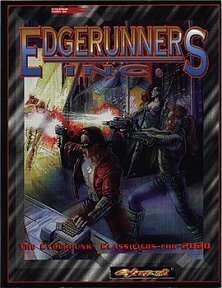 You can read about (and so use in your game) Edgerunners as a corporation offering services for hire, there is an array of NPCs classified by role that your group can hire on a mission-by-mission basis to fill in any gaps, and - of course - some available jobs that the party can hire on to do. What's not to like? We begin with information about Edgerunners themselves, who are it appears a division of a corportation called StreeTemps. Based in Night City, their business is as an employment agency for temporary workers, and a lot of it is stuff like fruit picking, factory/warehouse work and the like, also secretarial, janitorial and security work. They also handle more 'professional' jobs... the sort of jobs a streetpunk might be interested in and capable of doing. For obvious reasons, this part of the business is Net-based and cannot be easily traced back to the parent company. We learn of the history of the corporation, and meet some of the leading members, as well as something of how they operate and their headquarters building. Next is the section of NPCs. These have a variety of uses from additional party members on a job-by-job basis if your party is light in a particular area of skills or expertise, they might be other 'punks that the party encounters... you might even use one as a well-developed character for a player in need of one in a hurry. For each there are background notes, operating style (covers what that individual is like as well as how they work) and a full stat block. In this section there are Solos, Medias, MedTechs, Techies, Fixers, Netrunners and a few fellows who defy classification. This is followed by Help Wanted, which provides masses of information on both those who are hiring and the jobs they need doing. While you'll need to fill in some details, you can pretty much run any of these adventures with minimal preparation. They are grouped by the employing corporation, and begin with brief notes on who they are and what their objectives might be, then each job is outlined with the original want-ad, and notes on the contact, mission brief, available support, opposition, complications you can throw in and how much the job pays. There's loads of background and intrigue to get your teeth into, and ample opportunites for fire fights. The nature of the jobs is pretty much what a cyberpunk would be expecting his Fixer to come up with: extrations, data theft, surveillance and the like. You can use the background information to create further adventures. Overall, this is a useful resource. It seems reasonable to assume that corporations might find the idea of a 'middle-man' corporation to outsource their more shady requirements through appealing, whilst actual cyberpunks might be initially wary and need to be reassured that they will not be cheated... there again, they run the same risk meeting a Fixer in a low dive bar anyway. The adventure seeds are excellent, and the resource bank of NPCs is sure to come in useful too. Worth getting, even if you don't want to make Edgerunners Inc. themselves part of your game world as you could run the missions anyway, or pull in whichever NPC might be of use in another way. Return to Edgerunners, Inc page.